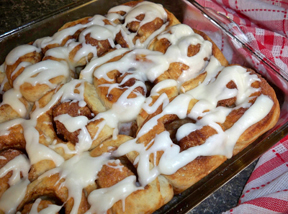 Soft and sweet, these cinnamon rolls are a nice addition to any breakfast or brunch table. 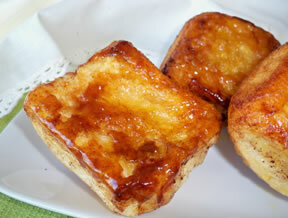 You can flavor the glaze with vanilla or try almond flavoring for a different flair. 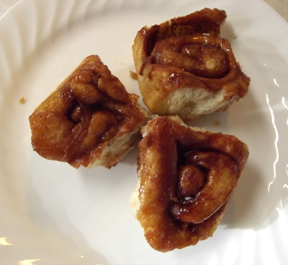 They are also scrumptious made into caramel rolls. Whether you buy frozen dough or make your own, follow the directions up to the point of shaping the dough into loaves. At that point, divide the dough into four equal parts. Mix sugar and cinnamon together. You will need to work with only one part of the dough at a time. Roll out on a floured cloth one part of dough to about 1/4" thick and 10x5" rectangle. Spread dough with a quarter of the butter. Sprinkle with a quarter of the sugar/cinnamon mixture. Roll up jelly roll fashion, starting with the long side. Press edges to seal. Cut into 8 to 10 equal parts (a little more than 1" thick). Butter baking dish (9" x 13" will hold 15 rolls) and place rolls with cut side down. Cover with a cloth and let rise for 1 1/2 hours. Repeat the process with the other three parts of dough. Bake at 350 until brown (about 20 minutes). Let cool for approximately 10 minutes and then turn out upside down on a cooling rack. Then allow to cool completely. Mix butter into powdered sugar. Add vanilla and milk to make glaze. Turn cooled rolls top side up and drizzle glaze on the rolls. Melt butter in saucepan. Add sugar and syrup. Stir over heat until sugar is well mixed. Divide caramel sauce between two ungreased baking pans (9" x 13"). Sprinkle with pecans. Arrange made out cinnamon rolls on top of the caramel sauce cut side down. Cover and let rise for 1 1/2 hours. Bake at 350 for about 20 minutes. Invert onto platter immediately. Do not glaze. 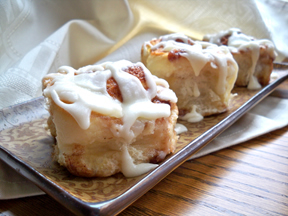 "Easy to make cinnamon rolls. Also, delicious! It was much simpler than making homemade bread from scratch. I will definitely make these again."